The world’s leading authority on addiction, Allen Carr’s Easyway, has released a new title, Quit Smoking Bootcamp, which is a revolutionary and concise version of the legendary Easyway method, perfect for those who are short of time or those finding it hard to remain a non-smoker. The book delivers content in short, dramatic chunks, to allow the reader to quit smoking in the easiest way possible. For maximum impact, it’s recommended that the book is read over four days, for example, starting on Tuesday, finishing on Friday, with the book presented in four bite-sized sections to make this as easy as possible. 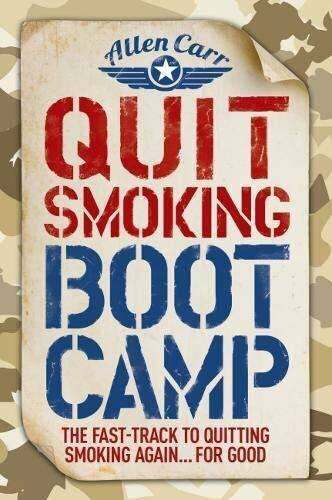 This book will change your mindset overnight, allowing you to quit smoking and/or vaping immediately and painlessly. Allen’s Carr’s Easyway has proved to be the most successful quit-smoking method of all time, curing an estimated 30 million people worldwide, offering access via the best-selling book, group seminars or the new online seminar program. Allen Carr’s Centers are available in 50+ countries across the globe and the method is endorsed by a wide variety of celebrities and opinion formers. Michael McIntyre, Richard Branson, Chrissie Hynde, Sir Anthony Hopkins, Ellen DeGeneres, Lou Reed and Anjelica Huston are long-term supporters of Allen Carr’s Easyway. Following his death in 2006, Allen’s lasting legacy is a dynamic, on-going, global publishing program which helps treat a range of issues. Following on from its phenomenal success in helping smokers, the Allen Carr’s Easyway approach has also successfully been applied to tackle other problems and issues including e-cigarettes, alcohol, weight, drugs, anxiety, debt, gambling, fear of flying, sugar addiction and Mindfulness.